174 people in our community are currently praying with you. 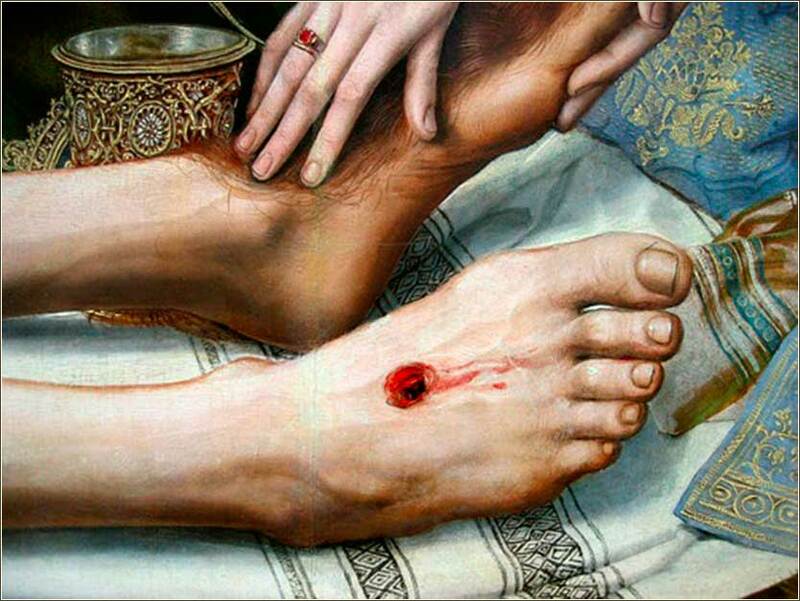 Oh Holy God, who has commanded us to love one another without fail, purify my soul. Let your Holy Spirit empower me throughout this day, to be obedient to the truth at every moment, so that I might love my brothers and sisters earnestly, from a pure heart. And let me always remember that I have been born again, not of perishable seed but of imperishable, through the living and abiding word of your Son; born again into a life of perfect love, obedience, and service. And if I am confused or do not know what to think or do, let me think of your Son, Jesus Christ, and ask myself what He would have done. For I will follow him even to the point of suffering and death, confident in his resurrection and the eternal reward for those that do follow him in sincere belief. Blessed Lord Jesus, I need you now because I am filled with stress and anxiety. But you have promised that if I read and remember your Word, and come to you in prayer, your Holy Spirit will come to me. I lay my burdens on you, precious Christ, as you have promised to take them. Please carry them for me so that I don't have to, for they overwhelm me. Replace my fears with your humble and gentle yoke, so that I will find rest for my soul today. Let me feel your love. I accept the peace of mind and quietness of heart, which you offer to all men as a gift. My praise and thanks that it is possible for me to lie down this evening in peace, and find the rest of sleep, by your gift. For with you, I have faith that I dwell in perfect safety. What should I fear, when you have promised to be with me for all time? I pray that I can find your perfect peace, by your Word and your promise, this day and every day, until I see you face to face. Book of Hours, French ca. 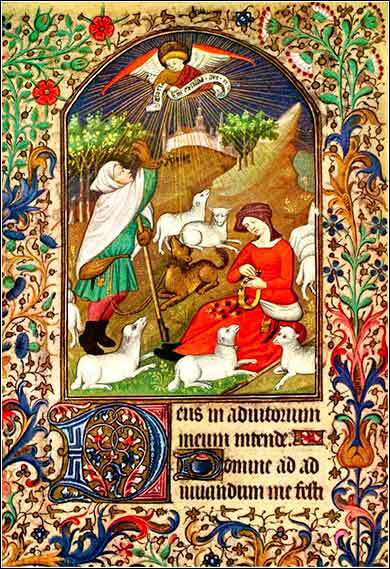 1425, showing the birth of Jesus announced to the shepherds. This old illuminated prayer book is remarkably well-preserved. “Therefore the kingdom of heaven may be compared to a king who wished to settle accounts with his servants. When he began to settle, one was brought to him who owed him ten thousand talents. And since he could not pay, his master ordered him to be sold, with his wife and children and all that he had, and payment to be made. So the servant fell on his knees, imploring him, ‘Have patience with me, and I will pay you everything.’ And out of pity for him, the master of that servant released him and forgave him the debt. But when that same servant went out, he found one of his fellow servants who owed him a hundred denarii, and seizing him, he began to choke him, saying, ‘Pay what you owe.’ So his fellow servant fell down and pleaded with him, ‘Have patience with me, and I will pay you.’ He refused and went and put him in prison until he should pay the debt. The problem here is not understanding precisely what Jesus is saying. The problem is actually doing it. Let me give witness. To forgive someone who has injured you is the most liberating thing in the world. It is worth every minute or every hour you might spend on your knees. It can be a titanic struggle! Every ounce of our earthly consciousness tells us hate, hurt, destroy. But again, I give personal witness that no matter how consumed with anger and hatred you are, forgiveness is possible. Here is my method, and I'm sure that of some others. First I pray somewhere quiet and private and ask the Holy Spirit to be with me. Then, I say the words, even if I don't mean them. “I forgive Jack for calling me a moron and making everyone in the room laugh at me, even though I was right.” (Actually, I have found that I might be even angrier when I was wrong!) Then I ask God to bless the person, that he or she might become rich, and famous, and admired by a host of friends, and have a life filled with every blessing possible, and know Christ and live in bliss for all eternity. That part is really hard! Then I think of the person as God's beautiful child, both now and as he or she was as an actual child, full of innocence and hope. Then I ask the Holy Spirit to reform my heart, to fill it with love and forgiveness. I think about the false value that made me angry in the first place, usually pride of some sort. I meditate on Scripture about vanity and selfishness. Wash, rinse, repeat. This works for me, even if it takes weeks or months or years.